Whether you love or hate the Harry Potter series, you have to give JK Rowling credit. She taught children that they could read "big" books. That 700+ pages could be a pleasure not some sort of medieval torture. She also brought back fantasy in full force. Oh my, the explosion of dragons, wizards, wands, and magical toys. When I was in 6th grade, my best friend's mom sewed us matching wizard costumes because we couldn't find any. I don't think kids have that problem right now, and it is almost singly related to the sheer popularity of a boy named Potter. So in a nod to fantasy fans, and as a way to indulge our own Potter fandom, the FAE street team held a Harry Potter contest. The rules? You had to be able to--some way, some how-- relate your item to the wizarding world. The deadline? Today! In this ACEO, titled "Follow the Leader", a trail of excited little dragonlings chase after the quick-as-lightening golden snitch. You see, to dragonlings, the golden snitch is the real hero of quiddich. Small, quick, agile and WOW can it fly. 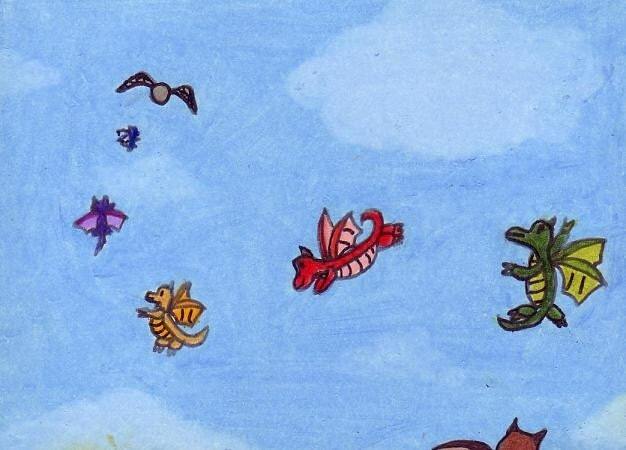 Wizard children may idolize the quiddich players, but dragonlings hang posters of their favorite golden snitches and cheer when one manages to just miss being snagged by the human players.